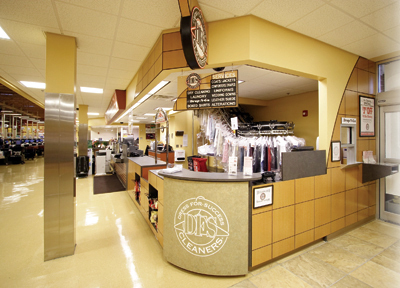 Enjoy Full-Service, Professional Garment Care at Hundreds of Supermarkets Nationwide. Dress For Success Cleaners started with a simple idea…to be able to do your dry cleaning at the same place you shop for groceries. Convenient, no hassle, and save time. Combine Convenience with Quality, Service and Value, and you have a formula for success. In 1991, Greg Buckingham founded Dress For Success Cleaners (DFS) based on those four simple principles. He opened his first DFS dry cleaning and laundry locations inside a handful of Smith’s Food King and Vons supermarkets in Southern California. Greg built an operating team consisting of grocery and dry cleaning professionals, and together they built the operating and marketing systems that would allow DFS to grow. Today, DFS operates hundreds of professional, full-service garment care locations conveniently positioned inside supermarkets nationwide. We take great pride in the quality of care and attention to detail we give your garments and household items. Looking for value? All of our locations are open seven days with extended hours for your added convenience. Our prices are very competitive and we offer a variety of outstanding specials year round. With DFS, you get great quality while saving time, money and gas! Today, we proudly offer a fifth plank…Trust, to those four original founding principles upon which our Company was built. Trust comes with over two decades of dry cleaning & laundry experience. Our customers trust us to take care of their garments. Thank you for entrusting us with your garments. We appreciate and value your patronage.